What is the Best Way to Reverse Vertigo? If you have tried everything for your vertigo without success, a new study now suggests there might be some hope of a relatively cheap and completely natural remedy to reverse vertigo. If you have Meniere’s disease, you are probably sick of doctors who inform you there is no cure. In fact, medical science has tried various remedies, and one is as ineffective and horrifying as the other, from diuretics to cortisone to ear injections to surgery. In most cases, Meniere’s disease affects only one ear. Meniere’s disease can occur at any age, but it usually starts between the ages of 20 and 50. 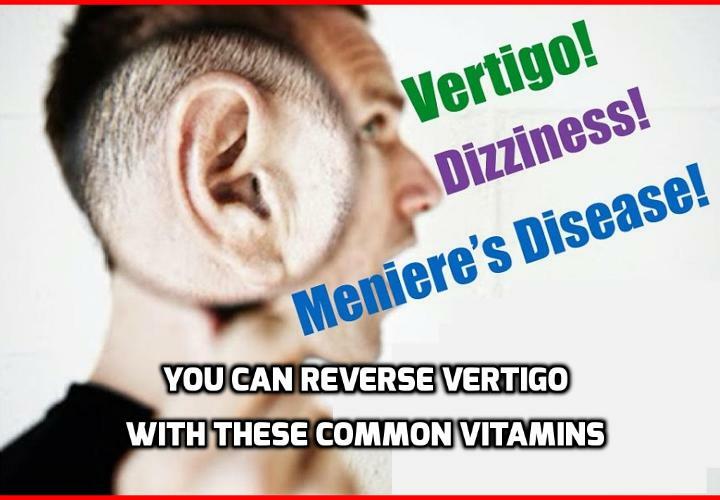 But a new study now suggests that there might be a simpler treatment to reverse vertigo that is related to Meniere’s disease that does not require drugs or hospitalization. Researchers have known for some time that free radicals are extremely active in the inner ears of people who have been exposed to antibiotics, chemotherapy drugs, and some other drugs. In addition, previous studies have also found free radicals in the inner ears of people whose hearing had been damaged by loud music. This made researchers at the Hiroshima University School of Medicine wonder whether antioxidants could fight off the symptoms of Meniere’s disease and either halt the progression or completely reverse the symptoms of this condition. They set out to find out and published their study in the journal Acta Oto-Laryngologica. They gave 25 patients three oral antioxidants daily: 300mg of rebamipide, and either 600mg of vitamin C or 300mg of glutathione. Overall, of the 25, 18 showed a clear reduction of disability. More specifically, of the 27 ears with hearing disorder, 12 showed an improvement, of the 27 ears with tinnitus, 17 improved and, most promising of all, of the 22 people with vertigo, 21 improved significantly. From this, the scientists concluded that radical scavengers had the potential to treat many of the symptoms of Meniere’s disease, especially the vertigo which is, by far, the most disabling of the symptoms that can lead to serious falls, car accidents, sick days, and so forth. Up to now, this is still the only study on the ability of antioxidants to remedy vertigo, but five years after this study, Israeli scientists decided to explore whether antioxidants could restore hearing in people who suffered from sudden hearing loss. After all, hearing is the one Meniere’s disease symptom on which this first study had almost no success. The Israeli team divided their 87 patients into a group that received the treatment and a group that received a placebo. The treatment to reverse vertigo consisted of 600mg of vitamin E and 1,200mg of vitamin C daily. By the end of the study, the hearing of those in the treatment group had improved by 29.4 dB at a rate of improvement of 63.3 percent. Those in the placebo group improved by 18.5 dB and 44 percent. As a result, there might be something to the idea that ear problems often involves free radicals that damage cells and affect either balance or hearing or both. Together with the vitamin supplements, do the exercises in our vertigo guide for a comprehensive vertigo solution that works.